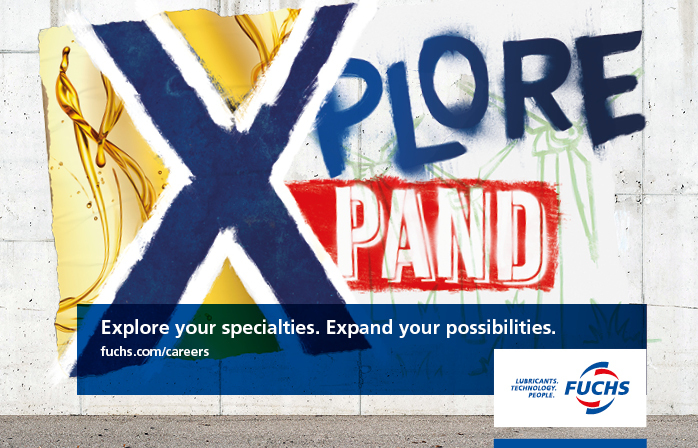 For all those who are curious to explore what is possible based on talent and drive, FUCHS is the ideal growing ground to nurture your capabilities, your ideas and your career. Regardless of your professional track record or your previous experience, you are welcome in a team, which will support you – and at the same time will grant you the freedom to find your own way to try bold new things. We face our challenges together. As a team, we find new ways to bring our expertise together to share knowledge and inspire each other. Your excellence is our success. We provide the tools you need to continuously expand your skills. Through targeted and individual trainings, we ensure your professional development and help you advance your career. At the FUCHS ACADEMY, our international training institution, we support you with technical and topical training courses that prepare you for your next challenge. We strive to fill job openings with skilled and experienced people from within the organization. As our employee, you are our most valuable resource. It is your knowledge, your experience and your commitment that makes successful business operations possible. To help you remain effective, we want to make sure you find the right balance between your work and private lives. Our size and organizational structure allow for short lines of communication and decision-making. You will enjoy being part of a closely knit international network of specialists. Within this network, you will be able to explore many opportunities to contribute your own ideas – and to develop professionally as well as personally.